A recording of Professor Ross’s presentation and the following debate can be accessed here (Audio). In a recent book (Fans of the World, Unite! Stanford University Press), co-author Stefan Szymanski and I argue that American sports fans are victims of monopolistic practices by sports leagues, which would be significantly ameliorated by the introduction of the European system of promotion & relegation. In addition, we identify significant inefficiencies that work contrary to the interests of fans and the sport as a whole when leagues are controlled by the participating clubs; club owners have an irreconcilable conflict of interest between the goals of their own club and the broader interest. European football is characterized by the latter problem as well: leagues controlled by club-interest, national federations conflicted by multiple stakeholders’ interests, international governing bodies conflicted by individual federations’ interests, and an unfortunate lack of transparency regarding policy development. A current example is the controversy over labour market rules in European football, where proposals fail to clearly identify the problem to be solved. The unique structure of the Indian Premier (Cricket) League provides a third model that addresses many of the structural issues in both American and European sports. After a brief overview of these points, the lecture will focus on an interaction between an American observer of sports law and business on both sides of the Atlantic and the audience regarding the attendees’ perceptions of policy problems in North America and Europe. Stephen F. Ross is the Lewis H. Vovakis Distinguished Faculty Scholar, Professor of Law and Director of the Institute for Sports Law, Policy and Research at The Pennsylvania State University. He has taught and written about sports and competition policy issues for over two decades, and is the author of a general Antitrust Law treatise as well books and articles on the design of sporting competitions and the law and economics of sports labour markets. On research leave this term in London, Ross will be co-teaching a course at the Cass Business School. Previously he has been invited to give expert testimony on sports issues before U.S. congressional committees and government agencies, as well as testifying in British litigation on behalf of the UK Office of Fair Trading. Ross, S. & Szymanski S. (2008). 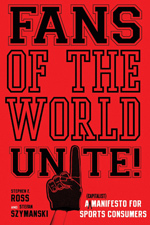 Fans of the World, Unite! A (Capitalist) Manifesto for Sports Consumers. Stanford: Stanford University Press.